Thank you so much for your comment and vote, Jola! Thank you so much for commenting and voting, Phyllis! Thank you so much, Surbhi! Thank you so much, Charlene, for stopping by and supporting my work! Thank you so much, Rebecca! I appreciate your comments! Thank you, Jennifer! I appreciate your comments and vote very much! Thank you so much, Christy, for your kind comment! Thank you, Mary! I had to gain trust before I could move in this close. The soft look in his eye was a big plus here! Thanks, Karon! It took a bit of patience, but I'm glad I stayed with it! Thanks for all your support, Benanne! 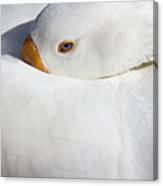 Thank you for featuring Resting White Goose, Krista!! I like this serene image....very restful...v.
Thanks, Shirley----ti's one of my favorites too. Phyllis, I love this photograph. 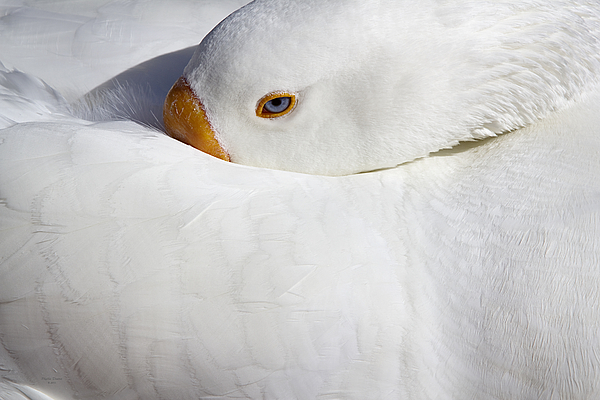 Nothing more pure looking than white feathers. What a great capture. fav. & vote. Thank you for your comments, Joy. Also, thanks for the fav. & vote. I really appreciate it! What beauty... both the goose and your photo, Phyllis. Thanks Ann. I hope I did her justice. Simplicity is a virtue, as it is in this remarkable photograph. Thanks Carl. I didn't want anything in the background to detract from the softness, so I inched my way in closer, until I got this. This is an extreme close up photograph of a white goose with her beak tucked under her wing.